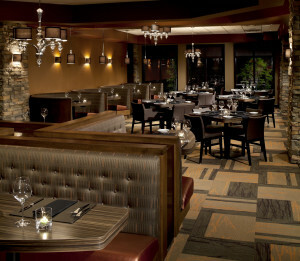 Elements Grill, the innovative restaurant at Copper Point Resort delivers elegance with refreshing simplicity. All the elements of a great meal, a contemporary restaurant with indoor and outdoor seating, Elements Grill is sure to become a favourite among foodies and the après golf and ski crowd. Sit down to spectacular mountain and golf course views inside one of the Columbia Valley’s most contemporary restaurants, Elements Grill. Catch a golf tournament on the patio’s 46-inch flat screen TV or order a snack and cocktail by the pool. Either way, you’ll be impressed. Elements Grill Executive Chef creates ultra-fresh seasonal menus with ‘smart food’ selections that inspire your healthy, active lifestyle. Room for a little indulgence? Exquisite desserts, fun martinis, and gourmet coffees are best enjoyed on the wrap-around outdoor patio. Let our expert planners arrange in-house catering and other details that might even include golf, ski or snowmobiling time for your group.